Minimalism is a tricky design aesthetic to get right, and it can come off cold and uninviting if shaped by the wrong hands. Luckily, interior designer Brian Paquette’s interpretation of minimalism for Perspective New York utilizes Sunbrella fabrics in a way that creates a warm and inviting space, thus challenging preconceived notions of typical minimalist aesthetics. Paquette is one of five designers chosen to share their unique vision of creative excellence in full-scale vignettes using Sunbrella fabrics for Perspective New York, a design event exploring Sunbrella performance and style through the eyes of inspiring designers. Drawing from his life experiences–from growing up in Newport, Rhode Island and attending prep school to exploring the Oregon coast–Paquette strives to create a sense of place in his designs. The result is often modern, sparse and time-worn; houses become homes where families can recharge, share meals, grow and change. Paquette’s Perspective New York vignette takes the idea of unreachable minimalist design and brings it into the everyday through thoughtful use of tone, texture and accessories. Inspired by the home of Belgian architect and designer Vincent Van Duysen, Paquette uses a limited color palette of natural tones to establish a sense of calm repose. A large sofa anchors the vignette and offers plenty of plush seating. Paquette made the fabric Plein Air by Richard Frinier available through Pindler the start of his vignette. The sofa is upholstered in soft linen-like Plein Air – Ecru. An oversized ottoman performs double duty as a coffee table and is upholstered in Plein Air – Flax. Vintage mid-century chairs reupholstered by Bjork Studio in Chemin – Granite by Richard Frinier available through Pindler offer additional seating without adding bulk to the design. Decorative pillows in Plein Air-Sand and Cortez Hill – Sand by Old World Weavers can be mixed and matched on the various seating areas or thrown on the floor when additional guests drop by. A wall-to-wall custom Sunbrella rug from Colonial Mills features a wide striped pattern that reinforces the neutral color palette and plays off the striped sofa and chair fabric. Lighting from Workstead and Jayson Home, and ceramics and art objects from Apparatus and Cody Hoyt recall the original design that inspired the vignette. 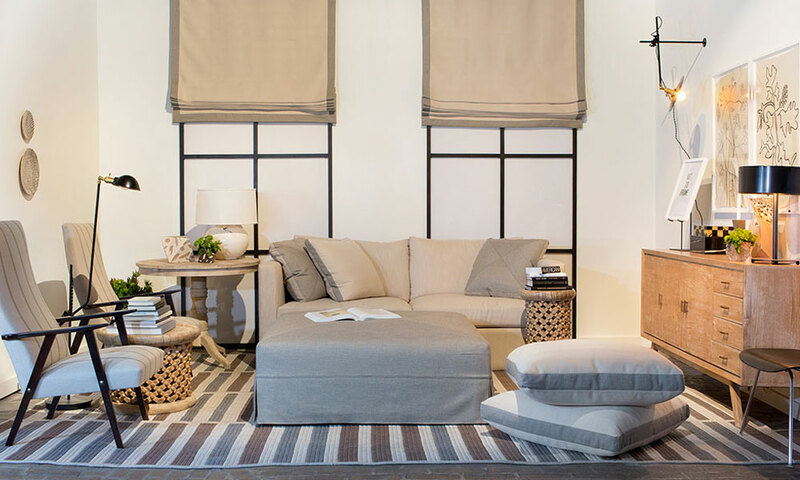 With soft, livable neutrals and carefully curated furniture and accessories, Paquette’s Perspective New York vignette creates a sense of place – one that many would be happy to call home.